The WagonWheel Handle is held in place by a quick release pin. It is removed with a pull so the handle can be quickly set aside whenever it is in the way. This model features a 6 x 6 x 12 inch aluminum barrel that holds a full 25 pound pug of clay and can produce extrusions up to 4-1/2 x 4-1/2 inches, without an expansion box. With this extruder, there are no heavy bars or levers to injure head or feet, no hydraulic pumps or air compressors with their inherent hazards. Instead, it is entirely hand driven. Turning the large handle drives a compound rack-and-pinion gear box which dramatically reduces the force needed to make an extrusion. No more than thirty pounds of force at the handle is needed to make an average extrusion! Here are the simplest, safest extruders available for small to medium extrusions - the kind most of us do most of the time. They have proved their utility and durability year after year. North Star extruders do not look like or work like any others. They are designed to be simple, safe and inexpensive. 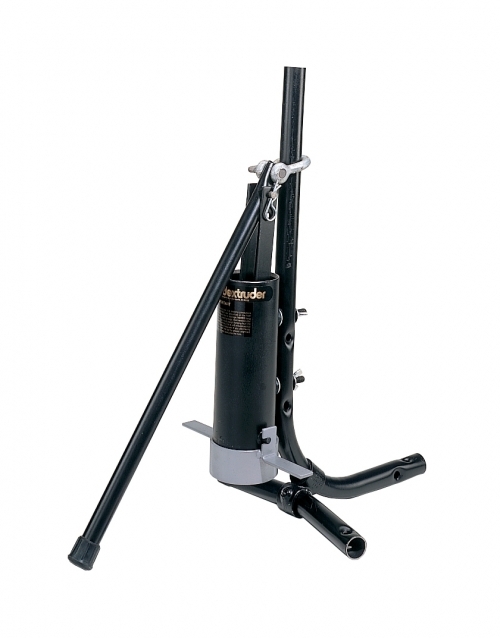 Both models feature a 4 inch square steel barrel tapered at the top for easy loading. 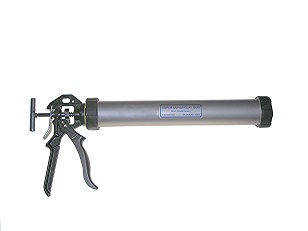 Each comes with a long extension handle to give extra leverage for small extrusions or stiff clay. 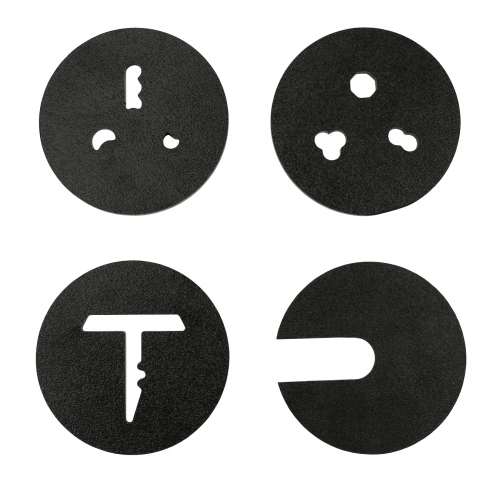 1/2" Thick HDPE Polyethylene Plastic Dies. 925A - Large Coils 3/4", 7/8", 1", 1 1/4"
Can also be used with the optional anodized aluminum Standard Die Set or the Hollow Die Set. This is an exceptionally handy, rugged, extruder for making small runs of a particular form. 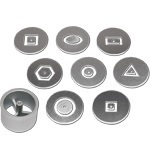 Includes a 1/2" coil die and two blank dies to customize to your needs. Our larger handheld extruder will hold up to three pounds of clay. The threaded barrel and cup allow for easy cleaning, loading, and die changes. All handheld extruder dies will fit this extruder. The XL Clay Gun includes a 1/2" coil die and two blank dies to customize to your needs. Clay Gun 2" Die Kit. Extrusion sizes: Round dies 1/4", 1/2", 3/4". Square dies 1/4", 3/8", 1/2". Ribbon dies 1/8" x 3/4" and 1/4" x 1 1/8". The dies can be altered with a small file to get unique shapes. Works with both the SC001 and SC033 Clay Guns. Made in the U.S.A.
Clay Gun 2" Handle Die Kit. 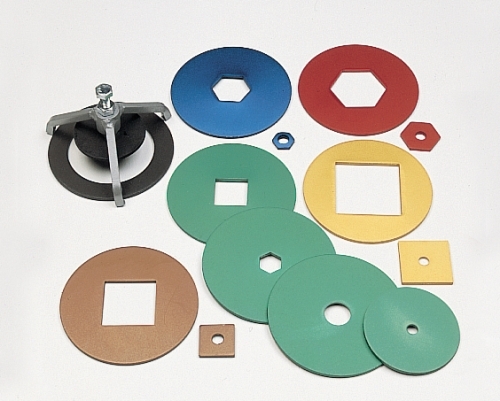 We have taken the same shapes from the popular 4" and 5" handle dies and made them available for use in our Clay Guns. This die kit will allow you to extrude handles for mugs, casseroles, and pitchers with ease using the Scott Creek Clay Gun. The dies can be altered with a small file to get unique shapes. Works with both the SC001 and SC033 Clay Guns. Made in the U.S.A.
Clay Gun 2" Shape and Coil Die Kit. Use these popular shape dies to form decorative additions to your pottery. The large and small coil die dies make extruding coils effortless. The dies can be altered with a small file to get unique shapes. 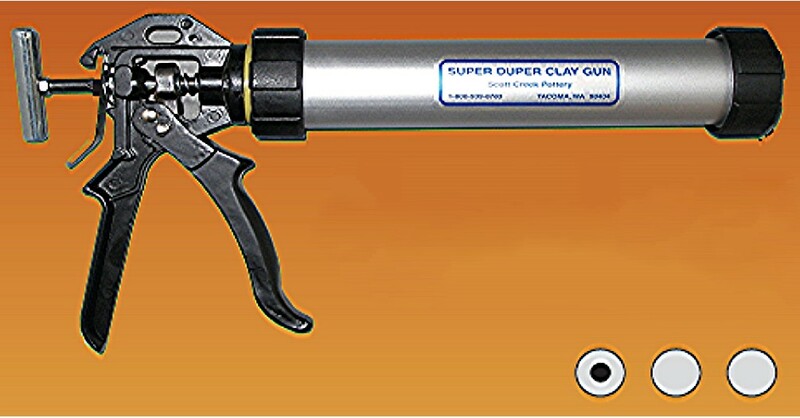 Works with both the SC001 and SC033 Clay Guns. Made in the U.S.A.
Clay Gun 2" Tile Trim Die Kit. 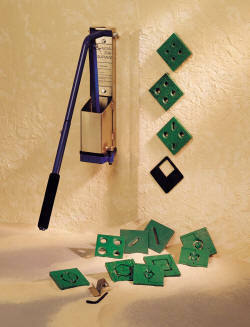 These dies were designed to extrude trim pieces for your tile projects. Add these special extrusions to your field tile and add that unique design element. The dies can be altered with a small file to get unique shapes. Works with both the SC001 and SC033 Clay Guns. Made in the U.S.A. 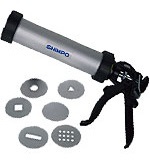 This extruder sports a 20" long barrel with a diameter of 2", fast action trigger, easy loading, and includes 4 disks. Packaged in a polybag with instructions.